Overcast. High 81F. Winds SSW at 10 to 15 mph.. Partly cloudy skies during the evening will give way to cloudy skies overnight. A stray shower or thunderstorm is possible. Low 68F. Winds SSW at 5 to 10 mph. Tarpon Springs City Commissioner Susan Miccio-Kikta will seek another three years on the City Commission in 2019. She says the city’s future is bright but could be brighter if City Hall were on solar power. Tarpon Springs City Commissioner Susan Miccio-Kikta poses with her 23-year-old son Matthew Haasch, left, husband Steve Kikta and her brother Stephen Miccio during her 2019 campaign kickoff party at the Tuscan Sun Italian Bistro on Sept. 17. 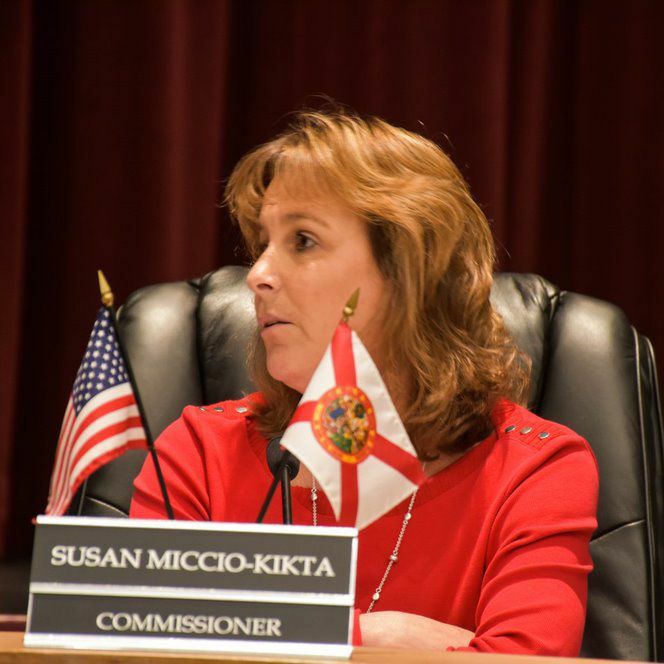 TARPON SPRINGS – Tarpon Springs City Commissioner Susan Miccio-Kikta recently declared her intention to run for office again in the March 2019 municipal election. Approximately 30 friends, family members, and supporters attended Kikta’s kickoff party at the Tuscan Sun Italian Bistro on Monday, Sept. 17, as the Seat 3 incumbent explained her decision to run for commissioner for the fourth time. “I’ve served the community for a long time, and I’ve always served with the best intentions of the community in mind,” she told the assembled group, which included Commissioners Rea Sieber and David Banther and former Mayor David Archie. Archie, who was barred by term limits from running for re-election in 2017, has announced he will seek to regain the mayor’s seat next year. Mayor Chris Alahouzos will also be on the mayoral ballot, he has said. Kikta served on the commission from 2008 until 2013, but term limits in the city charter forced her to sit out a year; she was elected again in 2016 and will face a young political newcomer Connor Donovan, in the March municipal election. She said her priorities include green initiatives and preserving the city’s heritage while continuing to promote Tarpon Springs’ growth. “I hope to have City Hall on solar someday, but we’ve already got solar power at the water treatment plant and we’re working with Duke Energy to bring electric charging stations in parking lots downtown and the docks,” Kikta said. The longtime mortgage industry veteran and mother of a grown son got remarried since the last election, and Kikta admitted she could’ve easily sat this one out to concentrate on her job, her family and her community work, including her extensive relationship with the Tarpon Springs Elks Lodge. But she said her desire to continue making a difference in her community overrode any doubts. Kikta, who moved to Tarpon Springs in 1977, said she has seen the city change and grow so much over the past few decades, said she likes where it’s heading and want to continue to play a role in shaping Tarpon’s future. The qualifying period for the March 12, 2019 municipal general election begins on Tuesday, Nov. 20 and ends on Wednesday, Nov. 28 at 5;00 pm, according to the Tarpon Springs City Clerk’s office. ● Mayor — Chris Alahouzos and David Archie. ● Seat 3 — Connor Donovan and Susan Miccio-Kikta. ● Seat 4 — Townsend Tarapani. Tarapani is seeking to return to the City Commission after a two-year absence following having served two consecutive three-year terms and thus ineligible to seek re-election in 2017. Banther, the Seat 4 incumbent, has reached the two-consecutive-terms limit and cannot run for re-election in 2019.